Complete your induction into the Mages Guild by creating your own staff. Speak with Raminus Polus about the Arcane University. Once accepted, your task is to have a personal Staff made. Travel to Wellspring Cave only to discover there is a problem with the mages who guard this sacred place. Make your way through the cave, taking care of (or avoiding) any enemies you encounter. On the farside of Wellspring Cave dispose of the necromancers lying in wait. Take the wood from the chest and return to Raminus, who instructs you to go see Delmar in the Chironasium. Delmar asks you to choose the type of enchantment you would like and requests a full day's time to finish the work. Return after a day has passed and Delmar will tell you to retrieve your custom staff from the cupboard in the back. After you have your staff go see Raminus to be promoted to Journeyman. After you have received all recommendations, travel to the Arcane University and speak to Raminus Polus. He will be in the Arch-Mage's Lobby during the daytime. At night, he will be unavailable to you. Once you are accepted into the guild by Raminus, speak to him about tasks to be told about the construction of your Mage's Staff. First you need to retrieve some special wood for the staff from Wellspring Cave, east of the Imperial City. Once you enter Wellspring Cave the quest log will direct you to speak with Eletta or Zahrasha. It isn't long before you encounter a slight hitch in this plan: Zahrasha has been killed by a necromancer just inside the entrance. Take the Wellspring Cave Key from Zahrasha's body, and continue on to discover what has happened here. More necromancers lie further in, so take care of them as you go. If you have a high enough Acrobatics skill, one easy way to dispatch them is simply to jump off the cliffs to your left. One by one, the necromancers will jump after you... to their deaths. However, after you jump off the cliffs, the only way to get back to the center of the island is through Wellspring Cave (the island is surrounded by invisible one-way walls which can be penetrated on the southwest corner of the island, between two large rocks. After you have your chat with Noveni Othran the invisible barrier is removed). Turn around and re-enter the cave. Only one of them will follow you. Kill them one at a time by exiting and re-entering the cave. Individually they are relatively easy to kill. Re-enter the cave and dive underwater. If you are an Argonian simply swim, otherwise use the Buoyancy spell (or any other spell that allows you to breathe underwater) while your enemies drown. Imperial soldiers on horseback often patrol the road outside the cave entrance, from just south at Fort Magia, north up the hill to Fort Urasek. If you exit the cave with necromancer(s) following you, make a quick run to the soldiers who will dispose of them for you. Once all necromancers have been defeated, check Eletta's body and then recover the wood for your staff which is in the Stone Chest at the center of the island. Return to Raminus and tell him what has happened. Raminus will direct you to find and speak to Delmar in the Chironasium to continue your staff creation. Your dialogue with him will determine the exact staff you end up with. You do not have to wait 24 hours to get your staff, just until the next day comes to receive your finished staff which will be in the cupboard in the back of the room. Afterwards, return to Raminus to be promoted to Journeyman and receive a new task. Full statistics on all the available staves are provided on the relevant page. All of the staves are level-dependent; for the best staff, it is best to wait until you are at level 15 to complete this quest. You have a choice of enchantments from three schools, covering nine possible effects. Fire Damage: Trolls and many undead are weak to fire, but most Daedra resist it. Frost Damage: Many types of undead resist frost damage and only a few enemies are weak to it. Overall, probably the least useful destruction staff. Shock Damage: Many Daedra are weak to shock and few enemies resist it, so this is a good choice. Charm: Charm spells are extremely cheap to cast yourself, and the effects of the staff aren't particularly powerful, either. You're probably better off choosing something else. Paralyze: This can be extremely useful, as paralyze spells are difficult and expensive to cast yourself. Paralyze is also on the list of magical effects that are not available for enchanting. At a high enough level, your staff can emulate a master-level paralyze spell. Even a short-duration spell is useful, as it knocks the target down. Ethereal creatures and skeletons are immune though. Silence: Another good choice, especially against all the necromancers you'll face if you continue in the Mages Guild quest line. Soul Trap: While perhaps not as useful as others, this can be handy if you don't want to bother casting Soul Trap yourself, especially if you pair it with Azura's Star to keep every item you have charged. Telekinesis: No real practical use, though it might be handy for thievery, decorating your house, or general mischief. If your character has the Atronach Birthsign, you can use the staff to recharge your magicka since, at high levels of spell absorption, all telekinesis spells have a chance to be absorbed instead of working normally. Dispel: Might be useful for dealing with conjurers or enemies who use shield spells, but otherwise not terribly useful. Save before talking to Delmar. This will allow you to restart the dialogue and change which staff you receive if you are not happy with your original choice. For the quest to advance, you must travel to the island through Wellspring Cave. If you instead bypass the barriers preventing access to the island from the lake, Eletta and Zahrasha will be found wandering on the island, but you will be unable to talk to them about the quest. You don't have to wait for the staff. Just steal it from the big cabinet with an alembic and a retort on top of it and you will automatically complete the quest. Once you have completed the quest you may hear Mages Guild members commenting on the Wellspring situation: "It sounds like the Council of Mages has been holding extra meetings recently. I'm not sure what that means." An achievement will be unlocked upon being promoted to Journeyman. 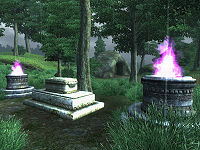 The journal states that the entrance to the grove can be found to the northeast of the Imperial City. In fact it lies directly to the east. Occasionally Delmar gets stuck in the stairs. If this happens just leave the room and go back in. If it persists just keep trying, and possibly leave the Arcane University and go back. He should be back to normal. Sometimes (especially in modded games) not all the necromancers will appear on the island after you get through Wellspring Cave. The game relies on the death of all three of the necromancers for the quest to advance, meaning the quest cannot be completed. However if you killed the necromancers by swimming along the lake and waiting for them to drown (or attacking them while in the water) some may have swam to the shoreline. Check along the shores around Memorial Cave, Fort Magia and Fort Uresek ? On PC, a player may advance the quest by opening the Command Console and typing setstage MG08MagesStaff 30. 10 I need to find the grove near Wellspring Cave, northeast of the Imperial City, to acquire wood for my Mage's Staff. 20 I have arrived at Wellspring Cave. I should speak with Elette [sic] or Zahrasha. 40 I have checked in with Raminus Polus. I now need to find Delmar in the Arcane University. 50 I've chosen a staff, and need to speak to Delmar when it's complete. 100 Finishes quest My Mage's Staff is complete. It is possible to use the console to advance through the quest by entering setstage MG08MagesStaff stage, where stage is the number of the stage you wish to complete. It is not possible to un-complete (i.e. go back) quest stages. See SetStage for more information. This page was last modified on 24 October 2018, at 06:26.